Under Armour was founded on September 25, 1996 by Kevin Plank, a then 24-year-old former special teams captain of the University of Maryland football team. Plank initially began the business from his grandmother's basement in Washington, D.C. He spent his time traveling up and down the East Coast with nothing but apparel in the trunk of his car. His first team sale came at the end of 1996 with a $17,000 sale. From his grandmother's basement, Plank moved to Baltimore. After a few moves in the city he landed at his current headquarters in Tide Point. As a fullback at the University of Maryland, Plank got tired of having to change out of the sweat-soaked T-shirts worn under his jersey; however, he noticed that his compression shorts worn during practice stayed dry. This inspired him to make a T-shirt using moisture-wicking synthetic fabric. After graduating from the University of Maryland, Plank developed his first prototype of the shirt, which he gave to his Maryland teammates and friends who had gone on to play in the NFL. Plank soon perfected the design creating a new T-shirt built from microfibers that wicked moisture and kept athletes cool, dry, and light. Major competing brands including Nike, Adidas and Reebok would soon follow in Plank's footsteps with their own moisture-wicking apparel. Plank opted to use the British spelling "armour" in the company name because the toll-free vanity number was still available for that version. People began to take notice of the brand when a front page photo of USA Today featured Oakland Raiders quarterback Jeff George wearing an Under Armour mock turtleneck. Following that front page, Under Armour's first major sale came, when an equipment manager from Georgia Tech requested 10 shirts from Plank. This deal opened the door to a contract with NC State, Arizona State, and other Division I football teams. With positive reviews from players, word began to spread and orders began to increase. That same year, Under Armour launched with several new apparel lines including ColdGear, TurfGear, AllseasonGear, and StreetGear. By the end of 1996, Under Armour had sold 500 Under Armour HeatGear shirts, generating $17,000 for the company. In 1997, Plank had $100,000 in orders to fill and found a factory in Ohio to make the shirts. Under Armour received its first big break in 1999 when Warner Brothers contacted Under Armour to outfit two of its feature films, Oliver Stone's Any Given Sunday and The Replacements. In Any Given Sunday, Willie Beamen (played by Jamie Foxx) wears an Under Armour jockstrap. Leveraging the release of Any Given Sunday, Plank purchased an ad in ESPN The Magazine. The ad generated close to $750,000 in sales. The following year, Under Armour became the outfitter of the new XFL football league, gaining even more attention during the league's debut on national television. In 2003, consumer sector focused private equity firm Rosewood Capital invested $12 million into the company. The same year, the company launched its first television commercial, which centered on their motto, "Protect this house." The company IPO'd on the NASDAQ in November 2005, raising $153m of capital. In late 2007, Under Armour opened its first full-line full-price retail location at the Westfield Annapolis mall in Annapolis, Maryland. It has also opened several specialty stores and factory outlet locations in Canada, China, and 39 states including the opening of its first Brand House in Baltimore in 2013 and second Brand House in Tyson's Corner, Virginia. In 2009, baseball Hall of Famer Cal Ripken Jr. formed an alliance under which the company would have significant presence at several venues and events under the auspices of Ripken Baseball, including providing uniforms for the minor league Aberdeen IronBirds and youth teams participating in the Cal Ripken World Series. The company is reported to be the major commercial sponsor for the reality TV show Duck Dynasty and has garnered attention for taking a stand supporting show "patriarch" Phil Robertson. Under Armour provided the suits worn by speedskaters in the 2014 Winter Olympics. The US speedskaters were losing while wearing the new Mach 39 speedsuits, but when they reverted to the previous model suits, the skaters continued to lose. Although there did not appear to be a design flaw in the suit that caused the poor results, the news of the suits caused Under Armour stock to drop 2.38%. The company, offering a reported US$250,000,000 over 10 years, also bid hard over Nike to sign NBA MVP Kevin Durant to an endorsement deal. However, Nike ultimately re-signed Durant after agreeing to structure a contract, offering US$300,000,000. On January 21, 2014, it was announced that the University of Notre Dame and Under Armour had come to terms on providing uniforms and athletic equipment for the university. This 10-year deal was the largest of its kind in the history of college athletics and became effective July 1, 2014. As of 2014, Under Armour has operated revenue and operating profit more than 30%, accelerating from their 2013 pace. Its share price has soared 62.5% this year. After its November 2013 acquisition of digital app maker MapMyFitness for US$150,000,000, in February 2015 Under Armour announced it had purchased the calorie and nutrition counting app maker MyFitnessPal for $475m, as well as the fitness app maker Endomondo for US$85,000,000. On January 6, 2016, Under Armour announced a strategic partnership with IBM to use IBM Watson's cognitive computing technology to provide meaningful data from its IOT kit and UA Record app. On March 3, 2016, the company became the Official Match Ball Partner of the North American Soccer League, starting with their 2016 season. On May 26, 2016, Under Armour and UCLA announced their plans for a 15-year, $280 million contract, making this the largest shoe and apparel sponsorship in NCAA history. In July 2016, Under Armour leased the 53,000-square-foot (4,900 m2) space formerly occupied by FAO Schwarz on New York's Fifth Avenue; the store opening is planned for 2021. FAO Schwarz had been paying $20 million in rent. On December 5, 2016, Under Armour reached a 10-year agreement with Major League Baseball to become the official on-field uniform provider of the MLB, beginning in 2020. Under Armour will replace Majestic, who has been MLB's uniform provider since 2004. Under Armour is widely known for its partnership with NBA athlete Stephen Curry, who is considered to be the "face of their footwear line". Originally signed to Nike, Curry joined with Under Armour in the 2013 offseason. As Curry became a two-time NBA Most Valuable Player Award winner and one of the most popular athletes in the world, sales of his shoes have become a major factor for the Under Armour brand, with stock prices rising and falling based on the success of the Curry shoe line. Under Armour is also well known for its partnership with PGA golfer Jordan Spieth, who has won three majors so far (the 2015 Masters, the 2015 U.S. Open and the 2017 Open Championship) and has recently launched his own golf shoe, "Spieth One." On October 10, 2018, Under Armour announced that it has signed Philadelphia 76ers center Joel Embiid to a sneaker endorsement deal. For the fiscal year 2018, Under Armour reported losses of US$48 million, with an annual revenue of US$4.977 billion, an increase of 9.9% over the previous fiscal cycle. Under Armour's market capitalization was valued at over US$10.7 billion in November 2018. Products manufactured by Under Armour include athletic shoes, t-shirts, jackets, hoodies, pants, leggings, shorts and accessories such as bags, gloves, caps and protective gear. Under Armour also produces American football, basketball and soccer uniforms, among other sports. The expansion of Under Armour's product lines, such as TurfGear, AllseasonGear, and StreetGear put Under Armour at the forefront of the emerging performance apparel industry. In 2003, Under Armour launched their Women's Performance Gear product line. Under Armour announced an addition to their ColdGear product line, called Infrared, that was released in 2013. This line claims to dissipate and re-circulate heat around the wearer's body using ceramic powder. This was purportedly designed so that the wearer's heat signature will not be picked up. Under Armour also had released a product with scent control technology in 2012 titled, "Under Armour Scent Control". This line claims to be designed so that the wearer's scent cannot be detected. Under Armour is inventing a new type of shirt called "Coldblack," which is designed to reflect heat and keep athletes cool in the sun. Under Armour has come out with new styles for football uniforms. In October 2012, Under Armour created "The Wounded Warrior" project for football uniforms. The University of Hawaii and Boston College wore the star studded cleats and the American striped jerseys. They were revealed when Boston College played Maryland on October 27, 2012, also when Hawaii played UNLV on November 24, 2012. The company produces the Speedform shoe in a Chinese bra factory. It has no insole and little stitching. Shoes are Under Armour's fastest growing product line, growing 31% from 2011 to $239 million in sales in 2012. In 2018, Under Armour launched two new pairs of connected running shoes at CES. Inside each shoe is a Bluetooth module, accelerator and gyroscope. On April 29, 2009, the United States Consumer Products Safety Commission announced a voluntary recall of all Under Armour brand athletic cups. The cups might break when hit, posing a risk of serious injury. They were sold from January 2006 through March 2009. On November 3, 2011, the United States Consumer Products Safety Commission announced a voluntary recall of all Under Armour Defender chin straps. The straps pose a laceration hazard when a player contacts the metal snap. They were sold from January 2008 through September 2011. Of Under Armour's current consumer base, 53% of Under Armour's customers are male and 47% of customers are female. Over 36% of customers have graduated from college, the majority of Under Armour's customers fall within the age range of 25-34, with the smallest customer base consisting of those aged 65+. 49.9% of Under Armour's customers have a household income ranging from $75,000 to $149,000 (Gfk Mediamark Research & Intelligence, 2015). UA Give Back is Under Armour's effort to become involved in different facets of the world community. They have different branches in their organization that specialize in each cause that Under Armour supports. They consist of the UA Power in Pink, UA Freedom and UA Win Global. UA Power in Pink is an Under Armour program that promotes women using exercise and fitness to fight breast cancer. UA Freedom is an Under Armour program that supports the efforts of the Wounded Warrior Project whose mission is to honor, raise awareness, and aid wounded veterans and military service members. UA Win Global is a children's athletics program which focuses on "underserved communities" by enhancing play areas, investing in sports programs and providing support for sports coaches. As of 2012, Under Armour was the sponsor of the Baseball Factory's "Premium Video Program", which holds more than 100 events for youth athletes across the United States annually. After ads of many brands ran on extremist channels promoting extremist content on YouTube, Under Armour pulled its ad from Alphabet Inc. owned YouTube. Under Armour promotes its products by sponsorship agreements with many celebrity athletes, professional teams and college athletic teams, a field in which it competes with other sports apparel companies. Any Given Sunday – Signed on to provide their apparel to Oliver Stone's film. The key scenes that featured Under Armour gave the products relevancy in the sporting nation. This product placement led Kevin Plank to place an ad in ESPN the Magazine to capitalize on the national exposure. The Challenge (Seasons 15–present) – Under Armour have provided the contestant's jerseys for them to wear when they are in competition. The Wire – Under Armour is prominently featured in the Baltimore-set HBO series. Under Armour products have also been featured in the Marvel movies (Avengers series, Iron Man series, Captain America series, etc.). House of Cards features Under Armour running gear. 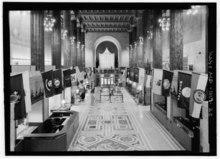 The historic lobby floor pictured in 1933, now covered by artificial turf for the UA Fitness Performance Center. In 2015, Under Armour released plans for their new Under Armour Fitness Performance Center powered by FX Studios at the Bank of America Building at 10 Light Street in Baltimore. The Fitness Performance Center is planned to take place in the building's lobby, covering historic murals of Baltimore's history by art deco artist Hildreth Meiere with artificial turf flooring. This plan has been seen as controversial due to the fact that Kevin Plank, Nate Costa (president of FX Studios) and developer Cary Euwer used state and federal tax credits to restore the historical building, yet the historical murals are being covered up by turf flooring. Many historians and local Baltimoreons have expressed public outcry that the design should be reconsidered and the murals should be saved. In January 2016 Under Armour initiated a marketing campaign featuring women hunters including an American woman named Sarah Bowmar. In August 2016 a video filmed by Bowmar, showing her husband spearing a bear and then rejoicing that he had hit it, went viral. The bear was found dead the next day. Under Armour was heavily criticized worldwide and as result, the company ended its contract with Bowmar a few days after the video became known. Plank expressed support for President Trump in February 2017. On February 7, 2017, two weeks into the presidency of Donald Trump, CEO Kevin Plank expressed his support for the administration and its friendliness to corporations. Plank's statements immediately drew strong public backlash, with many Under Armour customers boycotting the brand. Numerous athletes contracted with Under Armour also spoke out in opposition to Plank's statements. Stephen Curry, the most valuable of the company's sponsorships, hinted that his loyalty to the company could be jeopardized if its actions do not reflect his values. Dwayne Johnson voiced disapproval with the CEO's personal attitudes being reflected onto the company's partners and employees. On February 15, eight days following Plank's statements, Plank took out a full-page ad in the Baltimore Sun to clarify his position and that of the company. The letter acknowledged that he had used "a choice of words that did not accurately reflect my intent" and described how his company valued diversity, entrepreneurship and job creation. He condemned the administration's ban on travel to and from seven primarily Muslim nations, adding "we will join a coalition of companies in opposition to any new actions that negatively impact our team, their families or our community." We at Under Armour are disappointed by the Administration's decision to withdraw from the Paris Climate Agreement as climate change continues to threaten our planet, our cities and our economies. Climate change is real and must be taken seriously by our business community, our customers, our neighbors and our elected officials. Sustainability has always been part of our DNA: it's integral to how we live and work and is essential to our environment. As a business leader concerned with creating American jobs, I disagree with the decision to exit the Paris accord. On August 14, 2017, Plank removed himself from President Trump's Manufacturing Jobs Initiative Council, following backlash over Trump's response to the events in Charlottesville, Virginia. In June 2018 a Facebook post and subsequent reddit thread emerged stating that Under Armour clothing was flammable and resulted in severe burn injuries to a child. At present there has been no public statement from the company, and public debate seems to circle around the question of what is distinct about fireproof clothing, flammability, and risk of burn injury. This was found out to be false. Though no recall was issued, a 2018 study found that Under Armour's material was more likely to result in a burn injury of the wearer than most other undergarment materials. ^ "Under Armour 2017 Annual Report Form (10-K)". U.S. Securities and Exchange Commission. February 28, 2018. Retrieved August 23, 2018. ^ Terry, Robert J. (September 26, 2005). "Analysts: Brand crossover risky for Under Armour". Baltim. Bus. J. Retrieved May 1, 2015. ^ "Where We Live: Global Locations". ^ a b c d e "Under Armour Performance Apparel History". International Directory of Company Histories (reprint). 61. St. James Press. 2004. Retrieved November 28, 2012 – via Funding Universe. ^ Kevin Plank; Everette Fortner (host); Brendan Boler (introducer) (October 3, 2008). Kevin Plank, Chairman & CEO, Under Armour (HTML5 video). Darden Leadership Speaker Series. University of Virginia Darden School of Business. Approximate time when fact is related: 8 min 55 sec. Retrieved May 2, 2015 – via YouTube. ^ "Under Armour CEO to cash in". Retrieved 2016-08-11. ^ Gelsi, Steve. "Under Armour's IPO doubles". Retrieved 2016-08-11. ^ Walker, Andrea (24 May 2007). "Under Armour to open retail site in Annapolis". Baltimore Sun. ^ Korman, Chris (15 February 2013). "Under Armour sets new course with Brand House". Baltimore Sun. Retrieved March 31, 2015. ^ "Under Armour Inks Deal With Cal Ripken Baseball". NYSportsJournalism.com. April 22, 2009. Retrieved May 2, 2015. ^ Swift, Tim (December 20, 2013). "Under Armour to stick with 'Duck Dynasty' franchise amid media uproar". Baltimore Sun. Retrieved May 2, 2015. ^ Robinson, Joshua (February 18, 2014). "How a Bet on High-Tech Suits Left U.S. Skaters in the Cold". Wall Street Journal. pp. A1, A10. ^ a b Santoli, Michael (December 19, 2014). "Yahoo Finance 2014 Company of the Year: Under Armour". Yahoo Finance. Retrieved May 2, 2015. ^ Perez, Sarah (February 4, 2015). "Under Armour Snatches Up Health And Fitness Trackers Endomondo And MyFitnessPal". TechCrunch. ^ Ray (February 4, 2015). "Under Armour (owner of MapMyFitness) buys both MyFitnessPal and Endomondo" (blog). DC Rainmaker. ^ "IBM Watson, Under Armour to Transform Health and Fitness". www-03.ibm.com. 2016-01-06. Retrieved 2016-07-12. ^ "NASL, Under Armour Announce Groundbreaking Match Ball Partnership". NASL. March 3, 2016. Retrieved March 3, 2016. ^ "Q&A With Under Armour Senior Director Of Global Football Antonio Zea". NASL. March 2, 2016. Retrieved March 3, 2016. ^ Wharton, David. "UCLA's Under Armour deal for $280 million is the biggest in NCAA history". Los Angeles Times. Los Angeles Times. ^ a b Coffee, Patrick (July 26, 2016). "In Big Retail Push, Under Armour Will Move Into NYC's Iconic FAO Schwarz Location". Adweek. ^ Wilen, Holden (December 13, 2018). "Opening of Under Armour's Fifth Avenue New York store delayed until 2021". American City Business Journals. ^ "Under Armour to make official MLB uniforms". MLB.com. Retrieved 2018-02-13. ^ Wattles, Jackie (2015-09-16). "Under Armour is upping its game with Steph Curry". CNNMoney. Retrieved 2017-08-06. ^ "TrueHoop Presents: You won't believe how Nike lost Steph". ESPN.com. Retrieved 2017-08-06. ^ Gensler, Lauren. "Under Armour Sales Jump 30% As Stephen Curry Shoes Prove A Slam Dunk". Forbes. Retrieved 2017-08-06. ^ "Waning interest in Steph Curry shoes? Under Armour stock slumps". USA TODAY. Retrieved 2017-08-06. ^ "Spieth 2 Golf Shoes | Under Armour". Under Armour®. Retrieved 2018-02-13. ^ Lorraine Mirabella, New York Daily News. "New York Daily News." Oct 10, 2018. Retrieved Oct 11, 2018. ^ "Under Armour Inc. - AnnualReports.com". www.annualreports.com. Retrieved 2018-12-03. ^ Burke, Monte. "Under Armour Unveils Its New Products For 2013, With A Little Help Form Arian Foster and Gina Carano" (blog). Forbes.com. New York City. ^ Staff (June 14, 2012). "Under Armour Launches New Scent Control Hunting Collection". AmmoLand. New Jersey, United States. Retrieved May 2, 2015. ^ Mirabella, Lorraine (May 1, 2012). "Under Armour poised for greater growth with new products". Baltim. Sun. Retrieved May 2, 2015. ^ a b Gandu, Gurvinder Singh (October 8, 2012). "Under Armour Unveils New Wounded Warrior Project Uniforms for Boston College and Hawaii". Complex.com. New York City: Complex Media. Retrieved May 2, 2015. ^ "Under Armour Recalls Athletic Cups Due To Injury Hazard" (Press release). U.S. Consumer Product Safety Commission. April 29, 2009. Retrieved May 2, 2015. ^ "Under Armour Recalls Chin Straps for Football Helmets Due to Laceration Hazard" (Press release). U.S. Consumer Product Safety Commission. November 3, 2011. Retrieved May 2, 2015. ^ "Mergent - Creating Global Financial Solutions". www.mergent.com. Retrieved 2016-02-10. ^ "Under Armour - Fourth Quarter Net Revenues Growth". Retrieved 2016-02-16. ^ "MRI+: Welcome". mriplus.com. Retrieved 2016-02-10. ^ Latzes, Samantha (October 9, 2012). "Baseball Factory and Under Armour Give Back to Baltimore" (Press release). Baseball Factory. Archived from the original on April 17, 2013. Retrieved May 2, 2015. ^ Mezzofiore, Paul P. Murphy, Kaya Yurieff and Gianluca. "Exclusive: YouTube ran ads from hundreds of brands on extremist channels". CNNMoney. Retrieved 2018-05-04. ^ Staff. "Athletes with Under Armour endorsements (Pictures)". Baltim. Sun. Retrieved May 2, 2015. ^ The Challenge: Battle of the Seasons Under Armour Promo a.k.a. Challenges Promo. YouTube. September 8, 2012. Retrieved May 2, 2015. ^ "Under Armour in public eye". The Baltimore Sun. July 25, 2008. Retrieved 2017-10-17. ^ "The Incredible, Tactical Undergarments Designed for the Avengers Cast". Gizmodo. April 14, 2015. Retrieved 2015-12-09. ^ "Here are all the brands that appear in 'House of Cards' season 3". Business Insider. Retrieved 2018-02-13. ^ "Rare artwork, underfoot, could soon be out of sight | Baltimore Brew". Baltimore Brew. Retrieved 2018-02-13. ^ a b c O'Reilly, Lara (August 19, 2016). "Under Armour cancels Trophy hunting contract with Sarah Bowmar". Business Insider. ^ "FORMER CLIENT: UNDER ARMOUR INTRODUCES 2016 WOMEN OF WILL HUNT CAMPAIGN". The Drift. January 20, 2016. Retrieved July 12, 2018. ^ Mazza, Ed (August 16, 2016). "Josh Bowmar Films Himself Spearing A Bear, Then Giggling Over The Kill". HuffPost. ^ Kulp, Patrick. "Under Armour CEO endorses Trump, Twitter users endorse shopping elsewhere". Mashable. Retrieved 2018-02-13. ^ Williams, Jack (2017-02-08). "Stephen Curry Takes Issue With Under Armour Leader on Trump". The New York Times. ISSN 0362-4331. Retrieved 2018-02-13. ^ "Athletes oppose pro-Trump comments made by Under Armour CEO". Newsweek. 2017-02-09. Retrieved 2018-02-13. ^ McGregor, Jena (2017-02-16). "In full-page ad, Under Armour CEO Kevin Plank tries to put praise for Trump behind him". Washington Post. ISSN 0190-8286. Retrieved 2018-02-13. ^ Bonesteel, Matt (2017-06-02). "'Climate change is real': Under Armour's Kevin Plank unhappy with Trump's Paris withdrawal". Washington Post. ISSN 0190-8286. Retrieved 2018-02-13. ^ Bieler, Des (2017-08-14). "Under Armour's Kevin Plank becomes second CEO to quit Trump advisory council". Washington Post. ISSN 0190-8286. Retrieved 2018-02-13. ^ "Are Under Armour Garments Flammable". Snopes. Retrieved July 22, 2018. ^ Petrilli, Tony; Ackerman, Mark. "Tests of Undergarments Exposed to Fire" (PDF). United States Department of Agriculture Forest Service. Retrieved July 22, 2018. Wikimedia Commons has media related to Under Armour. Under Armour Indonesia Indonesia's official website.